Discussion in 'Guitars in General' started by Brock, Mar 8, 2008. I know that there are many stories about pawn shops selling great items for little money..... this guitar isn't exactly the holy grail but it was great money. $20 bucks with a hard shell case. The neck isnt the original, but it plays and sounds great. Cool stuff. Well, you can't really beat $20 for a guitar. Nice score! I like those old cheap MIJ guitars. Sometimes the pickups in those can be quite good. I played it thru my Budda and it has really big sound. My wife was even impressed with its tone. Especially the neck pickup. I've always had a major weakness for kitschy cheap guitars. I'd have paid at least $50 for it. Something tells me that thing would kill set up as a slide guitar! Funny... I thought the same thing! I owned one really bad playing one in the mid 60s, a Kawaii, but I knew guys that had Teisco Del Reys that played wonderfully. Back then, I had no idea the nut could have been altered to make the action lower. I just knew I couldn't play it. Next guitar was a Ric 330/12, so i didn't worry over it, either. I almost never see those old MIJ guitars anymore, anywhere, except that there's a guitar shop here that the owner collects the really oddball ones, and has them hanging on display in the shop. I should go in there with my camera and take some pics of them. it looks vaguely teisco-ish. any idea what it is? 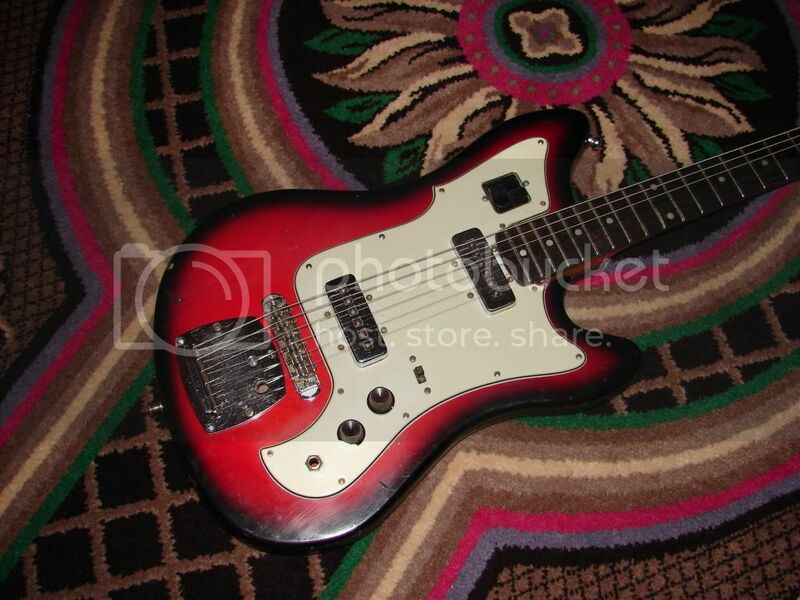 I'm thinking Teisco... but they made so many models and without the original neck its hard to tell unlees I can find a picture of another like it.